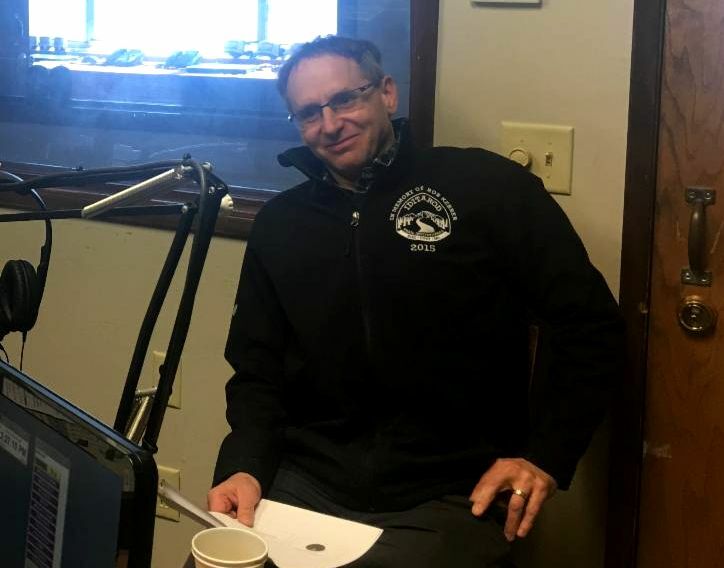 ▲ In March, PMC CEO Phil Hofstetter spoke during PMC Live on KFSK about proposed state budget cuts and possible impacts to PMC. 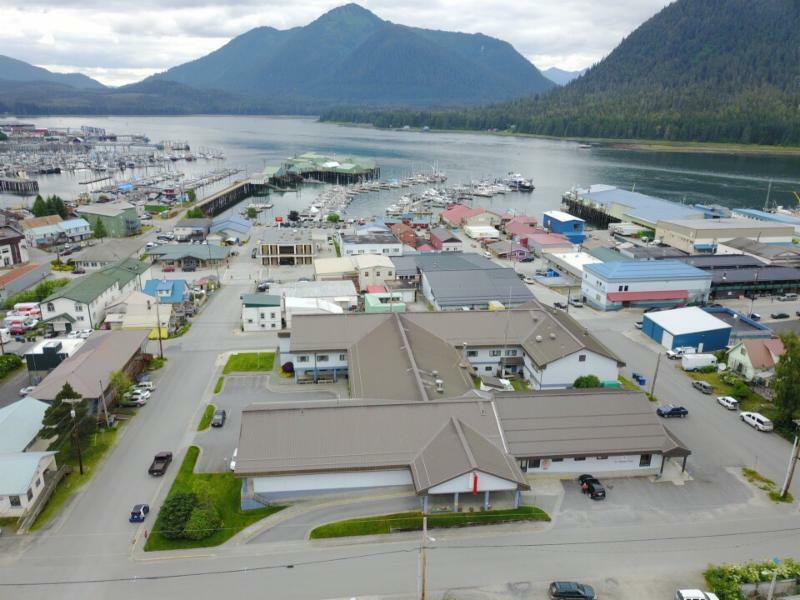 ▲ CEO Phil Hofstetter meeting with legislators in Juneau. 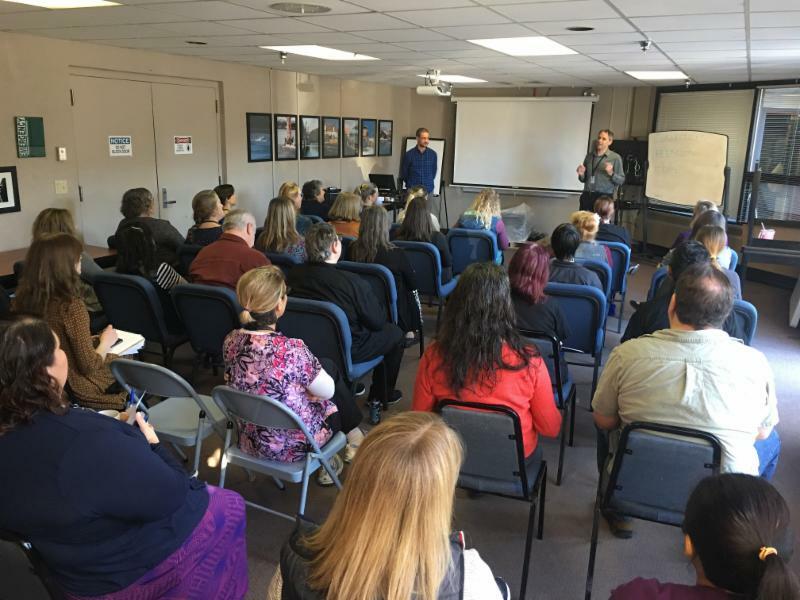 ▲Phil Hofstetter, CEO, and Matt Pawuk, PMC information technology lead, presenting at the PMC Employee Forum. Working to protect funding for PMC. I attended the Legislative Fly-In meeting organized by the Alaska State Hospital and Nursing Home Association (ASHNHA) on Feb 26-28 in Juneau. 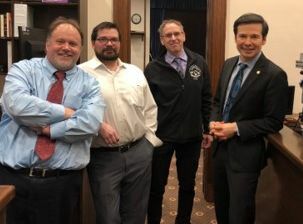 The governor's proposed budget was the primary topic, with a number of presentations and breakout sessions with various Department of Health & Social Services (DHSS) department directors, deputy commissioners and Commissioner Adam Crum. We discussed potential impacts of the governor's proposed budget cuts to hospitals across the state. There was an opportunity to hear from senators and representatives and discuss the challenge of the budget cuts. I was able to meet with Senator Bert Stedman’s office and Representative Jonathon Kreiss-Tomkins to describe the significant impact the cuts could have on Petersburg Medical Center as a small, rural community, critical-access hospital. Senator Stedman’s office requested a financial analysis detailing the expected impact on PMC of a 38 percent cut to Medicaid. The exact details related to healthcare impacts remain unknown at this time. Rep. Kreiss-Tomkins asked me to testify in front of the Senate Affairs Committee on March 8 along with Becky Hultberg, CEO of ASHNHA. Please visit PMC's website to view slides from the presentation. Employee Forum Petersburg Medical Center staff attended our quarterly Employee Forum on Tuesday, March 19. I shared with staff an overview of PMC activities over the past few months. Cindy Newman from Human Resources gave an update on new staff and said farewell to a few employees. Laurie Miller, laboratory manager, gave a breakdown about how our active shooter drill went. Elizabeth Bacom, quality/infection prevention manager, explained some new features happening with infection control, and Matt Pawuk, IT lead, demonstrated to staff some new technology. Petersburg Medical Center is always looking for ways to improve patient experiences. We invite you to contact us with any concerns you have regarding services at our facility. Please click here to fill out an anonymous patient survey. You can also share feedback by giving us a call at 772-5724, or emailing us at chadwright@pmc-health.org. T ake advantage of fitness activities at Parks and Rec! • Flex Fit: Mondays & Thursdays 8:30-9:30am & Saturdays 10:15-11:15am. Mitkof Dance Studio offers more then just kids' dance classes. Check it out! WAVE wellness classes meet at the Community Center from 10am-1pm the first Saturday of every month. Christina Sargent will talk about caring for plants. Participants will paint a pot and germinate seeds. Some starts (baby plants) will be provided. Wave welcomes any starts you may want to share. If you have extra pots in which to plant your new starts, please bring them. Come with a friend to enjoy planting and painting. 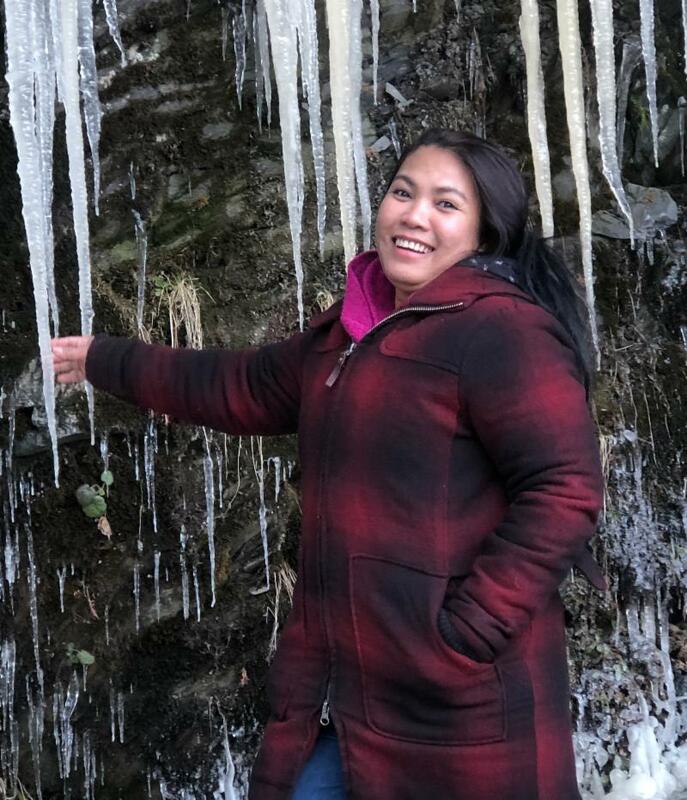 Four years after moving from her home in the Philippines to Petersburg in 2010, Grazel Edfelt was hired by Petersburg Medical Center as a housekeeper in the Environmental Services Department. Today, a career detour and another four years later, Grazel is managing that department. “My favorite part of the job is learning new things every day,” Grazel said. And Grazel has learned a lot during her time at PMC. 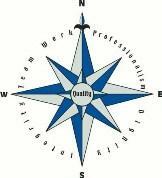 After five years as a housekeeper, she trained as a certified nurse aide and passed the state CNA exam in 2015. She then became a full-time CNA at PMC's Long Term Care. Then, a year ago, Grazel noticed a job opening in her old department, environmental services (EVS), formerly known as housekeeping. She realized that she missed her time in EVS and decided to apply. She was hired and began working two part-time jobs: as a CNA and as an EVS tech. Though she loved both jobs, she slowly began to transition back to full-time work with EVS. 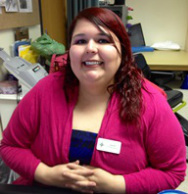 In November, Grazel was hired as EVS manager, where her journey of learning continues. Grazel traveled to Atlanta, Georgia, in February for a weekend training to become a certified healthcare environmental services technician (CHEST). The CHEST training reviews infection prevention, cleaning and disinfection throughout the facility, environmental services equipment and supplies, working safely and responsibly, basic floor care and maintenance, environmental monitoring, and quality control. Now that Grazel is certified, she will share with her staff the same training she received. It will become standard to give every new EVS employee CHEST training before they begin. Grazel was born and raised in the Philippines. In 2007 she met Andy Edfelt. After spending three years talking and getting to know Andy, Grazel moved to Petersburg, and they married in 2010. When Grazel isn’t busy working at PMC, she and Andy and their dog Q-Tip enjoy time outdoors, hiking and camping. ▲Grazel Edfelt, Environmental Services Department manager, joined PMC in 2014 as a housekeeper. 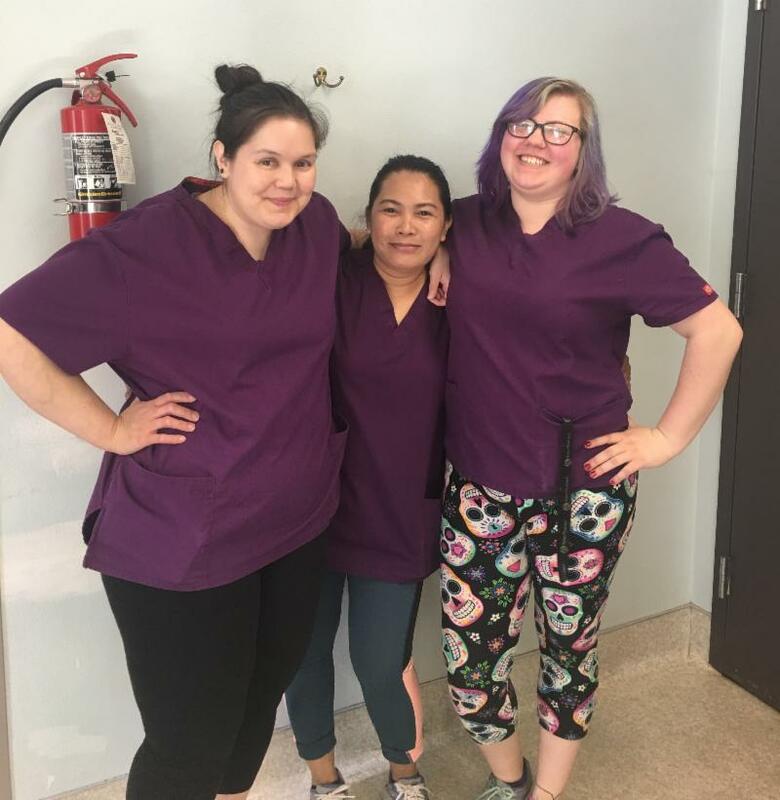 ▲ Grazel Edfelt (center) with two of her employees: Hannah Jackson (left), and Shawnee Cook (right). 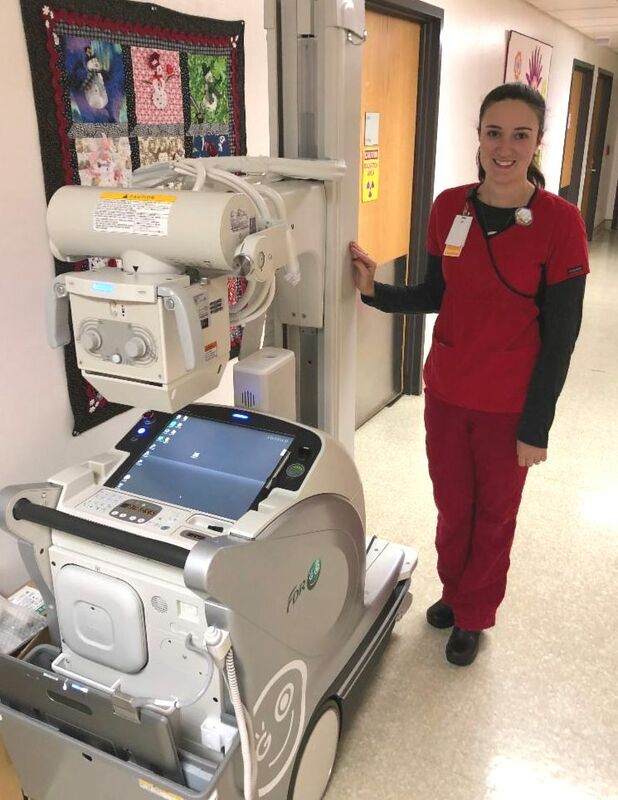 ▲ Sonja Paul, Radiology Department manager, with the new portable X-ray machine. ▲ Sonja Paul, Radiology Department manager; Elizabeth Thomas, radiology assistant; and Tiffany Shelton, radiology technologist. The Petersburg Medical Center Radiology Department offers ultrasound, X-ray, mammography screenings, bone density screenings, and CT scans. 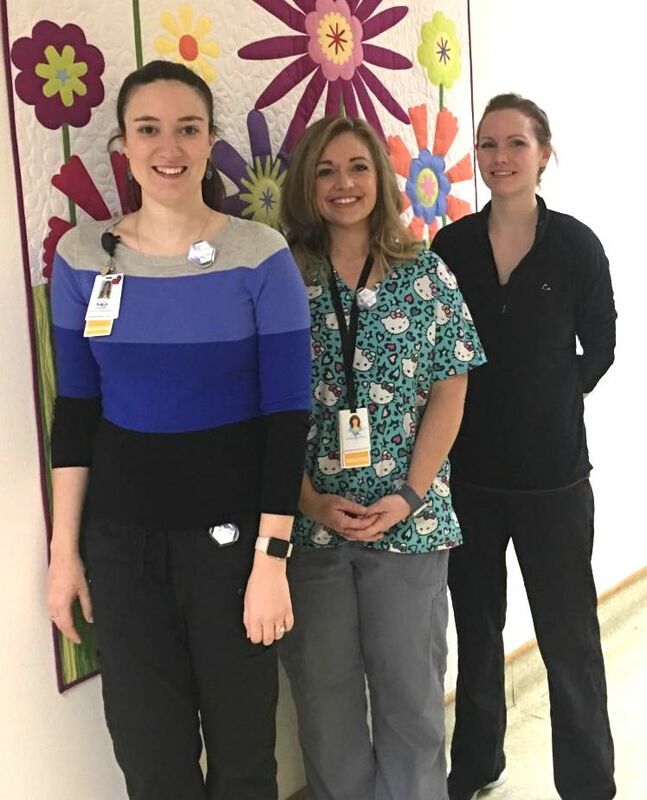 The department is managed by Sonja Paul, imaging manager and radiologic technologist, and includes Tiffany Shelton, radiologic technologist; Elizabeth Thomas, radiology assistant; and Maria Wagemaker, laboratory and radiology receptionist. In 2015, the Radiology Department added a new mammography machine to screen for breast cancer. Staff recommend scheduling a yearly mammogram if you are 40 or older. You can refer yourself, meaning you do not need a referral from a physician to schedule a mammogram. However, PMC asks that you select a physician with whom you can review your mammogram results. In January 2018, PMC installed ​a bone densitometry machine, otherwise known as a DEXA machine. The DEXA machine measures bone mineral density, offering the best method of screening for osteoporosis. Bone fractures are more likely in people with low bone density. A bone density scan is recommended for women after menopause or at age 65 and up, and for men at age 70 or older. The department also has a CT machine. Aside from its typical job of evaluating bones, blood vessels, and soft tissues inside the body, staff can also now perform low-dose lung cancer screenings. If you have a smoking history and are between the ages of 55 and 77, ask your doctor if it would be a good time to be screened. The newest equipment added in the department is the portable X-ray and digital radiography machine, or portable DR machine. The machine allows staff to bring X-ray services to a patient anywhere at PMC, instead of requiring the patient to come to the Radiology Department. The department also recently upgraded to a new, all-digital X-ray system. Staff can now capture images within seconds. Physicians can view images immediately on the portable machine, and images can be sent to other facilities instantly. This system results in quicker image processing and shorter wait times. Happy spring! This March, residents celebrated the fabulous women in their lives on International Women’s Day with tea and scones. There was also a Men’s Coffee. It was a treat for the residents to see all their favorite fellas visiting together at the center. Residents and their guests celebrated St. Patrick’s Day by enjoying baked potatoes with all the fixings at their annual baked potato bar potluck. On St. Patrick’s Day, residents welcomed parade-goers with a reception to enjoy great company and some bagpipe music by Mike Moyer. The residents are grateful for the volunteers and visitors who have contributed their time during this chilly month to make the days a bit brighter with homemade meals at the Petersburg Emblem Club’s and Presbyterian Church Deacon’s luncheons, live music performances, help with photo albums, assisting with outings, and more! Per the residents at their March council meeting, they are looking forward to the warmer months ahead – especially Mayfest and summer picnics! ▲ Matt Pawuk, PMC's I.T. lead, and Annie Lewis, LTC resident, at the Petersburg High School basketball game. 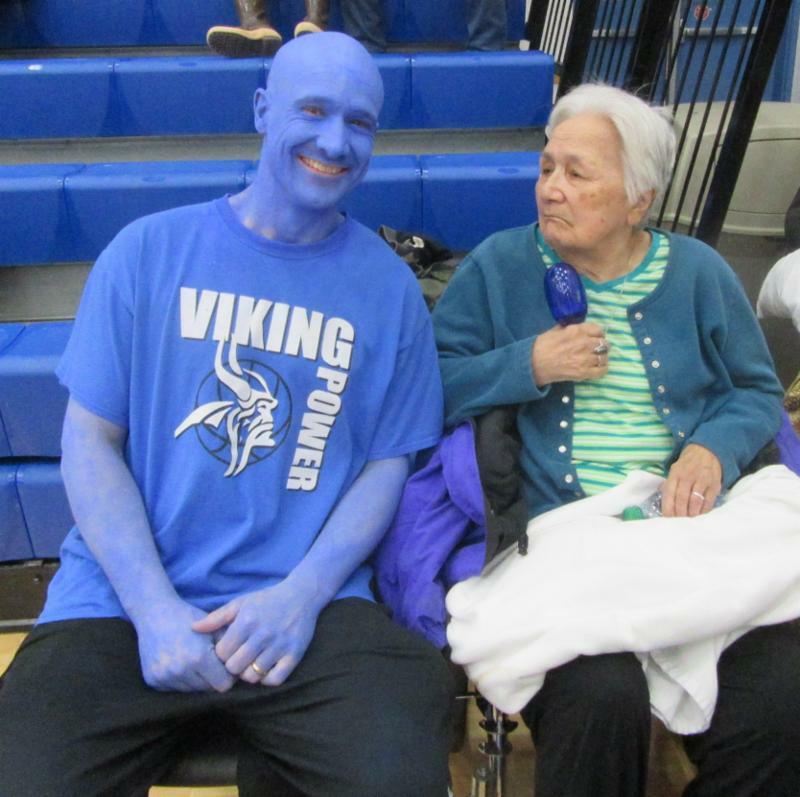 Pawuk paints himself blue in support of the PHS Vikings! 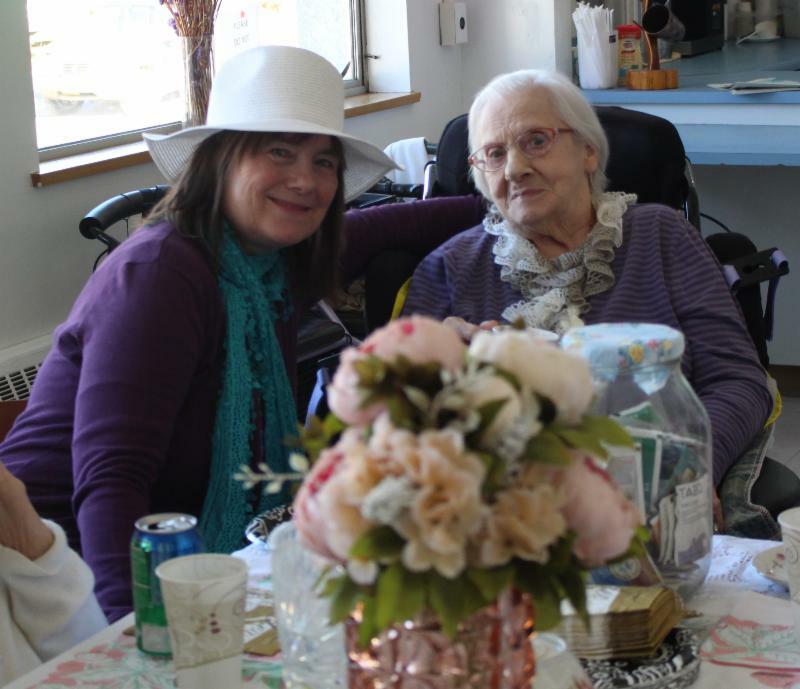 ▲ LTC resident Gladys Olsen and visitor Heidi Lee at the LTC Women tea and luncheon.